I always enjoy hearing from friends and readers. Recently a long time friend emailed me asking for a camera recommendation. And thus begins my 2011 Christmas Camera Recommendation post! I hope all is well, and congrats on the 2nd little one coming your way. Michelle and I are expecting our 1st in February which brings me to the reason I am e-mailing. We are looking to upgrade our digital camera so we can take lots of photos! We currently use a Fuji F70EXR but were considering upgrading to a higher end camera such as a Canon Rebel. do you think that an upgrade to a much higher end camera like that is a good purchase, or would we be fine just sticking with the Fuji F70EXR? Yo RW! Cool, what is your max budget? Samantha has this camera in blue. It takes great photos & video, especially in bright situations. For dark environments it will need to use the a flash. Our friend Joy just ordered one today too… If Shelly wants a new camera to carry in her purse or (soon) her diaper bag then the Elph 100 HS is hard to beat. This is a very stylish and simple to use camera. However, it also features a very nice lens that captures a lot of light. 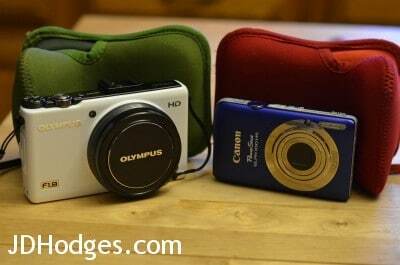 This allows for decent photos even in poor lighting (often without the aid of a flash). The control system is easy to master especially when you use the control wheel that encompasses the lens and lets you quickly scroll through settings/options, as well as rear controls for additional adjustment. I highly recommend this camera if you do not want to mess with a DSLR and interchangeable lenses. A precursor to the XZ-1, it is similar in features and quality. However, in my opinion the controls/handling take a bit more time to master and it is not quite as easy to simply pick it up and (easily) take photos as good as with the XZ-1. If you are willing to take the time to learn the ins-and-outs of it then it truly is a bargain. NOTE: both Canon/Nikon DSLRs are excellent cameras, but the lenses you pair them with will have a huge impact on quality. For the price of a DSLR & nice lens(es) you could buy the ELPH and the XZ-1 to have a pretty potent photo taking combo. Beyond that it really comes down to how much you want to do with your camera: IMHO you cannot beat a Canon or Nikon DSLR for capturing a toddler taking their first steps or getting a photo of them in their crib sleeping soundly (even when it is dark and you don’t want to use a flash). Otherwise, if you are happy with getting great photos when the light is already good and you don’t mind taking a few shots before you finally get that toddler walking capture in focus… then the ELPH/XZ-1 produce great results: as long as you realize their limitations.